Softball has climbed back to .500 with a four-game winning streak against its formidable NESCAC opponents. These victories come after seven straight losses to Amherst, Eastern Connecticut State University, and Williams. With just seven more games to go in the regular season, the team will hopefully continue the success of their close but triumphant matchups. The Cardinals had nearly a week to recover from an 11-3 loss at the hands of Williams, and it was definitely worth the wait. On Saturday, April 14, the team swept Bates in a doubleheader at home. Game one started out as a stalemate, with no runs from either team until the midpoint of the game. Thanks to senior captain Julie McDonald’s tough work on the mound, five consecutive Bobcat batters were shut out, three from strikeouts. McDonald went on to strike out six more in the game, and currently is sixth in the NESCAC in strikeouts with 66. 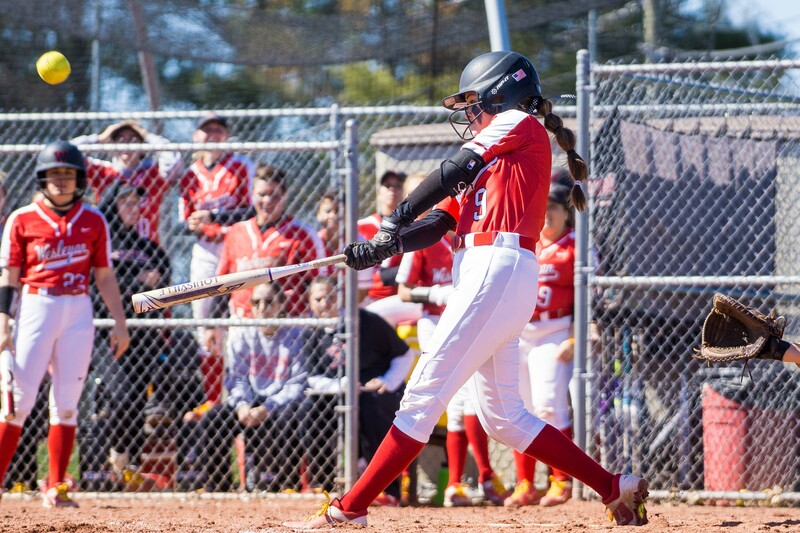 However, McDonald’s success continued to the offensive; in the bottom of the fourth, she led off with a walk, followed by a single from first-year Danielle Rinaldi. Fellow senior captain Rielly Wieners stepped up to the plate, allowing McDonald to steal third and then run home on the catcher’s throwing error. The solitary run was enough to take the lead and the eventual victory. The Dirty Birds weren’t as fortunate in the second game against Bates later that night, trailing the Bobcats 2-1 going into the sixth. The game began with a back and forth in the first inning with a bunt single from Rinaldi to score junior Olivia Gorman. The 1-1 score remained until the fifth with a run from Bates, but Wesleyan quickly responded in the sixth with two more runs. McDonald hit a single, followed by a bunt from Rinaldi and a single from Wieners. With bases loaded, first-year Marina Williams ran to first after an error by the second baseman, plating McDonald for the game-tying run and Rinaldi for the lead. The action stopped at the top of the seventh as the Bobcats were unable to close the one-run gap, and Wesleyan finished the day with another win, this time 3-2. The Red and Black hosted Trinity just three days later on Tuesday, April 17 in a victorious doubleheader. With Rinaldi on the mound, the Bantams were kept to just four hits over the course of both games. In the first game, both teams remained scoreless until the top of the fourth when Trinity took a two-run lead. The Cardinals didn’t catch up until the sixth: Rinaldi notched a single to the right, followed by a left-center homer from Wieners to score them both and tie things up at 2-2. After a silent seventh inning, the game continued into an extra eighth inning and started with a run from the Bobcats. Yet after loading the bases with three outs to spare, first-year Brenna Monroe hit a solid double to score Rinaldi and Wieners and finish the game with a 4-3 victory. Rinaldi, McDonald, and Williams each recorded two hits while McDonald continued her success on the mound with nine strikeouts in eight innings and no earned runs. The second game also brought Rinaldi success as she stepped up to the mound and pitched a complete game shutout. Offensively, Gorman got the game off to a good start with a single up the middle and scored just a few batters later after a single from Williams. The 1-0 lead remained until the bottom of the fifth, when the Cardinals dramatically emerged from their nest and totaled five more runs thanks to doubles from Rachel Curran ’20 and Rinaldi and singles from first-years Maddie Ikeda and Gorman. Rinaldi finished the game with a simple 1-2-3 seventh inning, walking off the field with no allowed runs or walks, seven strikeouts, and just four hits. 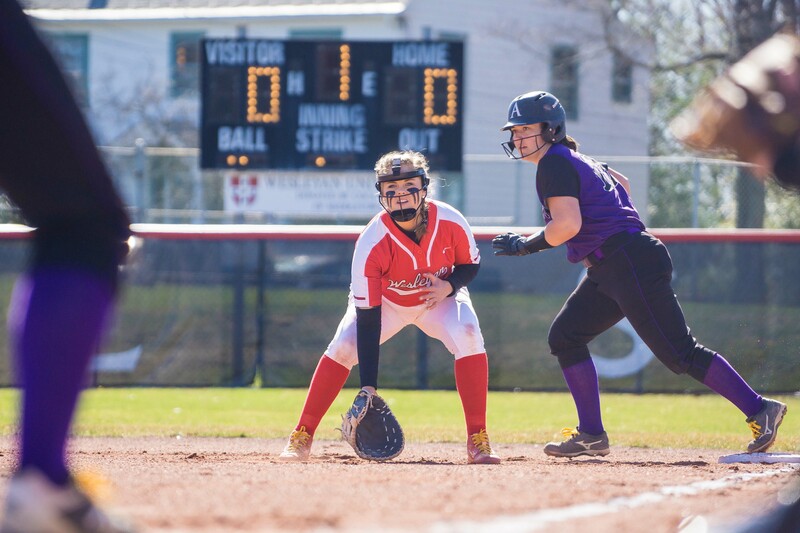 While Wesleyan championed over these two NESCAC opponents, both teams aren’t in their conference; in softball, the ‘CAC remains divided between the East and the West, and the Cardinals are in the West with formidable Amherst and Williams. However, the team will get a crack at another conference opponent this weekend as they host Hamilton in a three-game series. The match-up begins tonight, Friday, April 20 with a 5 p.m. start. Saturday’s doubleheaders are on the team’s Senior Day, honoring the team’s two seniors, McDonald and Wieners. Zoë Kaplan can be reached zkaplan@wesleyan.edu.